Happy #GirlPowerFriday, everybody! 2017 has been so special for me, especially due to the incredible people I've met and connected with. Cue Katie Monacelli, creator of bkindcity- BKC for short. She's a bright light with contagious energy that makes you want to hug a stranger. Katie describes her company as east coast streetwear meets west coast unisex apparel company with a feel good/ feels good vibe. 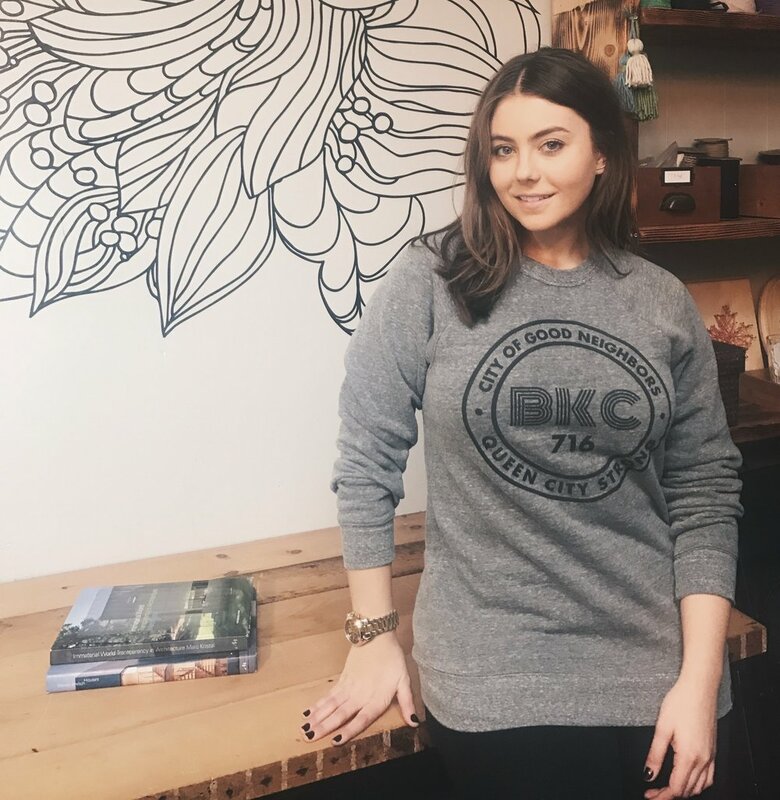 Bkindcity is a group of inspired individuals, looking to affect the perspective of commercial society with a culture of creative positivity and kindness. Through the avenue of an apparel company, they have found a way to bring our vibe to the masses. The best part is? Katie always gives back. For every softest crew sweatshirt bought, she donates a meal to the Buffalo City Mission. OK, so let's talk about these softest crew sweatshirts! You know that sweatshirt you can't take off? The one you wore to bed last night. The one you threw on this morning to go grab coffee? The one you wore to practice (and maybe the bar?) This is the softest thing you’ll ever put on your body. Trust me- I NEVER take it off. Not even kidding, I am sitting here typing this blog post in my black one now. Proud owner of a grey one too! Another reason I love this sweatshirt is it embodies Buffalo, or as we all it here the "Queen City" and "City of Good Neighbors". The sweatshirt even has our area code on the front! Honestly, not sure how this sweatshirt could get any better. To purchase one of these sweatshirts, you can purchase them for $58 at Modern Nostalgia on Hertel Avenue in Buffalo. You can also contact Katie directly and she will ship worldwide to you! She also sells beanies, tanks, tees and many other sweatshirts. Most styles are shown on her Instagram! This post is NOT AT ALL SPONSORED. All opinions are my own and you know that I only share things that I love with you! However, if you'd like to purchase something from Katie- be sure to mention "Caralyn Mirand's post" to get 10% off! I can't wait for you to fall in love with this sweatshirt as much as I have! Be sure to follow Katie @katiemonacelli and @bkindcity. Her positivity and kindness makes my feed so much brighter!